Take a week to work on your improv and acting skills this summer. First we’ll cover the basics of improv acting, so you know how to walk on the stage with nothing and create worlds. Then we will get in there and work with your improv to make it as full and rich as possible. Including playing with character, timing, interactions, reactions, and working together. By the end of the week you’ll be ready to take the stage in our own performance for your friends and family. And blow them away! Visit our main Improv Summer Camp page for information on camps for younger children. 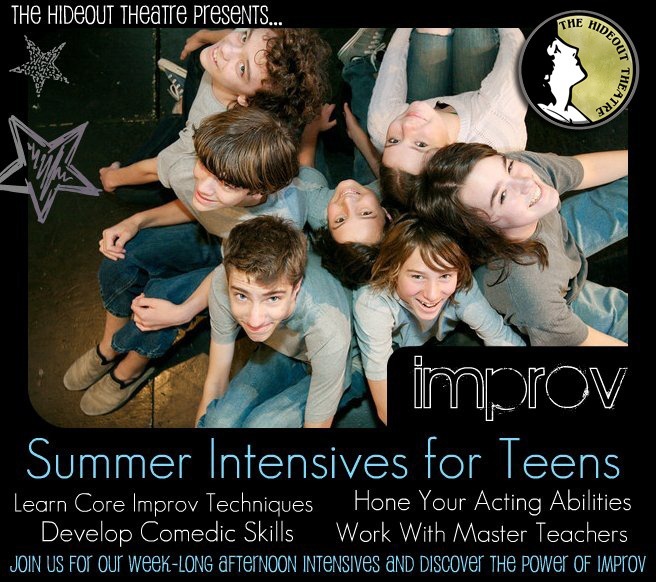 Each of our Teen Intensives will have a special topic, or improv format, that is used to focus the instruction. July 22-27 – Megan Sherrod – The Shopping Mall Format – this delightful format lets you see all of the interesting characters and happenings that surround a single event. You’ll work on strong characters, timing and beats for scenes and developing full scenes that work together to make one awesome show. The showcases for the teen intensives will be 4:00-5:00 on Friday. We understand that cancellations are sometimes necessary. If you need to cancel anytime up until a week before the start of the camp you are registered for we will refund you the price you paid, minus a $25 administration fee. If you want to transfer to another camp there will be no penalty. If you cancel with less than one weeks notice, we will refund you half of the price you paid, or allow you to switch to another camp minus a $25 administration fee. If you don’t show up or cancel after the start of the camp there will be no refund unless you have a doctors note, or other compelling emergency. In these cases you will only be issued a credit of the amount you paid for another camp, or class at the Hideout Theatre minus a $25 administration fee. All Cancelations should be in writing – email is preferred.